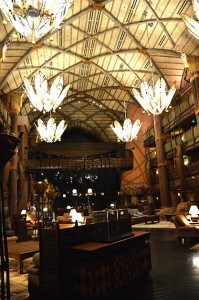 One of Disney’s newer luxury resorts and Disney Vacation Club (DVC) destinations, the Animal Kingdom Lodge is a truly unique way to vacation in style at Walt Disney World. 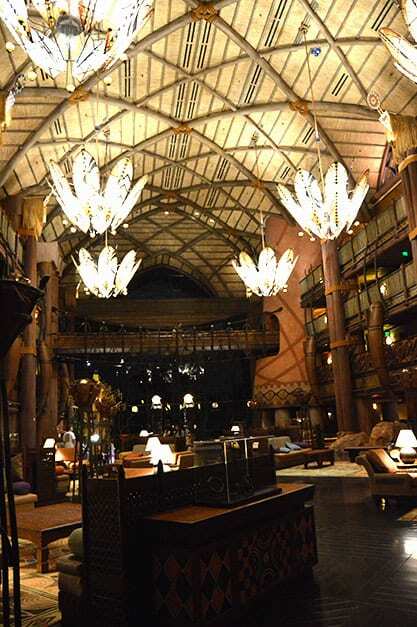 In addition to the beautiful accommodations, delicious restaurants, and amazing pools, what really sets the Animal Kingdom Lodge apart is its’ expansive savannas surrounding the resort, which are teeming with all kinds of exotic wildlife. 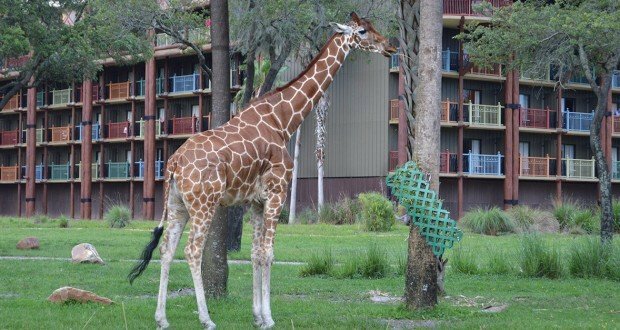 I had the pleasure of staying at the Animal Kingdom’s Kidani Village this past January, and let me tell you, there is very little, at least in my book, that compares with the excitement of waking up to a giraffe outside your window, or enjoying the view of wild animals and birds from your balcony. 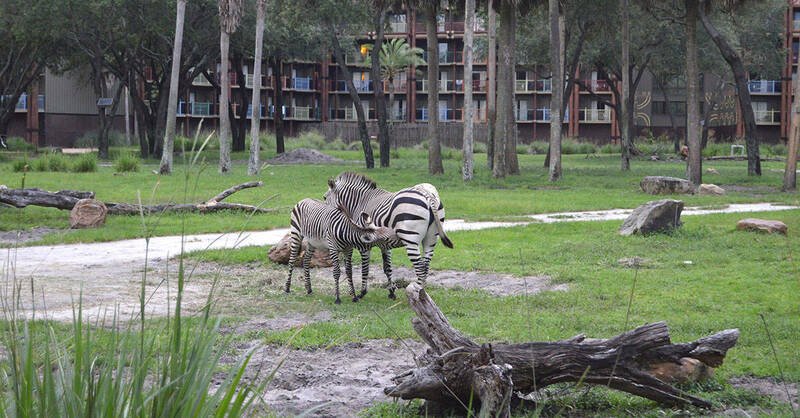 The animals that you are likely to see on any of the Lodge’s three savannas are similar in type to many that you can see on the safari at Disney’s Animal Kingdom Park. Which exact animals you may see during your visit will probably be dependent on the weather, your exact viewing location, and the time of day you are there. I noticed during our stay that most animals tended to be out and active during the afternoon and early evening, so that’s a great time to stop back at the hotel to catch a break, and see some animals in action. In fact, even if you aren’t staying at the Animal Kingdom Lodge, it can make a great afternoon pit stop and get you out of the parks for a while, especially on those hot, crowded days. 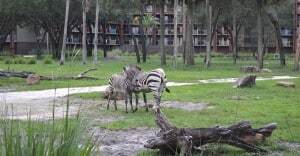 You can take a bus from any theme park to the resort, and enjoy an amazing view of the animals at either Jambo House (the Main Hotel building) or Kidani Village (the DVC building.) As an added bonus, The Mara, at Jambo House, is one of my favorite quick-service restaurants on Disney property, so you can grab lunch and make an afternoon of it, if you so choose. Disney made sure to include some very recognizable “fan favorite” animals that can easily be identified, and are tons of fun to spot and watch. These include Zebras, Giraffes, Ankole Cattle and Pink Flamingos. My family has a soft spot for giraffes, especially, and we were always delighted when we saw them wandering the savanna! 1. Greater Kudu: corkscrew shaped horns. 2. Bongo: notable reddish brown coat, with white stripes. 3. Blesbok: striking white facial markings, and ridged horns. 4. Eland: largest antelopes on the savanna and have ridged horns. 5. Gemsbok: extremely long horns. 6. Waterbuck: white markings on their backsides. They’re most often spotted close to the water hole. 7. White-bearded Wildebeest: grey with black faces – they look just like the Wildebeests in the Lion King! 1. Impala: medium sized, reddish-brownish animals can leap up to TEN FEET in the air! Wow! 2. Thompson’s Gazelle: little guys, adorably nicknamed “Tommies,” were my favorite! They are small, brown animals, with a black “racing stripe” on their sides, and they can run up to a whopping fifty miles per hour! 1. Abyssinian Ground Hornbill: This is a large, black, turkey-sized bird, with a black bill. 7. Ruppel’s Griffon Vulture: a large black bird with a huge wing span, which is often visible, as the birds often spread their wings to sunbathe and cool off! Now, I can’t guarantee that you will see every single one of these animals out on the savanna, but during our stay, we sure saw a lot of them! If you’re looking for a specific animal, don’t hesitate to ask a Disney Cast Member for help. They are there to provide information, and they’re all so kind, welcoming and helpful. Also, one really exciting thing we noticed during our stay was that there were several baby animals out on the savanna, namely baby Giraffes and Zebras! They were SO CUTE, and we loved watching them. When you visit, ask the Cast Members if there are currently any baby animals at the resort, and if there’s a certain time or location that is best for spotting them. Trust me on this one, a baby zebra is one of the cutest things I have ever seen! Hopefully you will spot some babies during your visit, but even if you don’t you are sure to have a wonderful time enjoying an amazing view of many different animals on the beautiful savannas. Check out our restaurant Review of Sanaa – Where guests dine on African/Indian fare while watching African wildlife just outside the window!